A perfect family hike, the Upper and Lower Grassi Lakes are located in the southern Canadian Rockies. These lakes receive their water from the Spray Lakes Reservoir on the Spray River and are emerald-colored. There are hiking trails here that have two routes. The easy route takes you through a gentle rising floor while the difficult route takes you through the wooded trail. This is also a very popular spot for climbers. A short distance away from Calgary, this is an easy trail to do for all ages. Fantastic picturesque view at Grassi lake wipe away exhaustion. Great place to picnic provided you leave no trash behind. Swimmers, mountain climbers, trekkers, dog owners, families with energetic kids - great choice for a weekend outing. 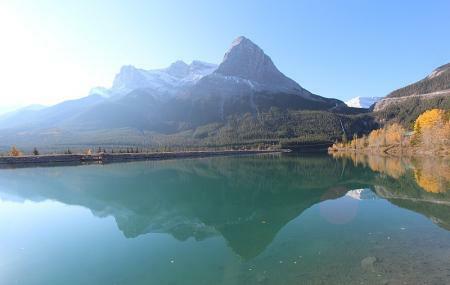 Great family hike located close to Canmore. Grassi Lakes is equipped with a beautiful view and walking trails. Great for picnics or photos. The scenic blue water is picturesque and has a wide variety of Wildlife species. Perfect for families or those looking for a more advanced hike. Grassi Lakes offers trails from beginner to experienced. The Grassi Lakes also have a bit of history, The trails themselves were hand carved by Mr.Grassi himself! A must see! The easiest and closest hike near Calgary and the lake is absolutely gorgeous.. highly recommended! The harder work if worth it, but bear in mind if there is ice and you don’t have proper gear, things will get tricky. The views along the way are stunning and the lake itself is a clear. Walk beyond the lake to see some ancient carvings and painting in the rock formations. The easier route is suitable for children and prams/strollers, albeit a bumpy ride!